The native YouTube client Minitube 2.2 was released a few days ago with playback problems fixed, updated translations, and a new subscriptions context menu. Fixed some videos not playing issue. 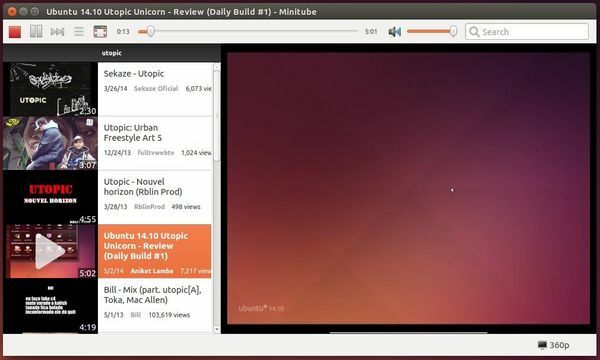 Added ‘Stop After This Video‘ Unity & Gnome 3 action under Playback menu. Added --stop-after-this command line switch so you can gracefully end playback from a SSH shell. Added subscriptions context menu: Unsubscribe, Mark as Watched. First check out your OS type, 32-bit or 64-bit, by going to System Settings -> Details. Finally, double-click the package in your file browser to open with Ubuntu Software Center. When it opens, click the Install button.